Last Wednesday Fiorentina played off against the Sporting Lisboa for the qualifying round of the UEFA Champions League and we were there to show our support for Florence’s soccer team. 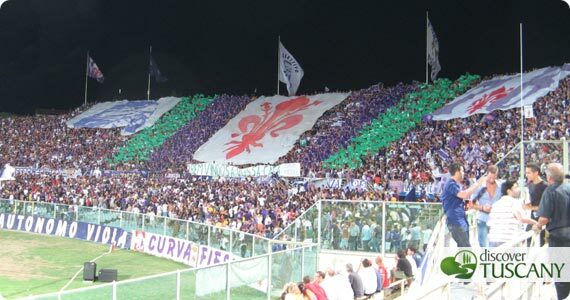 The “curva Fiesole”, the area of the stadium where the most passionate Fiorentina fans sit, even prepared a banner and beautiful color choreography to welcome the Portuguese fans since the two cities are “twin cities” which you can see in the photo above. We can’t say that the game was a really good one: the home team had long moments in which they were stretched to their limit by the fast, darting runs of the opposting team and it looked as if they risked droping out of the competition. After the first half, Fiorentina was under one goal and some of the super critical fans of the Viola even started to boo the team. Not very supportive at all. The Viola, however, played much more confidently in the second half with supportive cheering from the Curva Fiesole encouraging them forward and equalized the game with a goal by the young and talented Jovetić. But it is also important to remember that Italian teams rarely play very well in August, while the Sporting demonstrated it was in great shape as a team. The 1-1 result allows Fiorentina to proceed to the next round of the Champions League where the draw has assigned Fiorentina matches against the glorious Liverpool, the Olympique Lyonnais (with which we have a score to settle from last year!) and the Hungarian Debreceni. It will be difficult to go beyond this round but it is important to both participant in the great matches of European soccer and in the great showcase offered by the Champions League. It will also be an excellent occasion for many Florentines to follow their home team abroad, combining rooting for the team with visits to other European cities :-).